NodeGrid Serial Console™ is not just for data centers. Retail, Remote Office and POD/POP environments normally do not have dedicated IT support staff available. So who will monitor and repair network and server downtime issues? Can your business afford to turn away customers or let employees sit idle during network or server downtime events? Maximized retail store, remote office and POD/POP IT uptime is possible without staffing a full time IT expert in every remote site. You simply need extremely reliable remote hands access. ZPE Systems’ NodeGrid Serial Console provides smart, consolidated “out-of-band” access and control of your retail and remote office IT equipment. In case your store’s router goes down, ZPE’s NodeGrid Serial Console automatically senses the network failure and activates your choice of cellular modem, over a cellular carrier and mobile plan of your choice. ZPE does not lock you into one or two predetermined cellular providers. Unlike our competitors, we simultaneously provision a seamless SSL VPN experience with your choice of static, dynamic or private IP address – so you don’t have to wonder what your store’s new IP address is during a severe IT breakdown event. ZPE’s Instant SSL VPN creates a tunnel back to corporate with the same exact IP address as before so your customers and employees are no worse for wear. 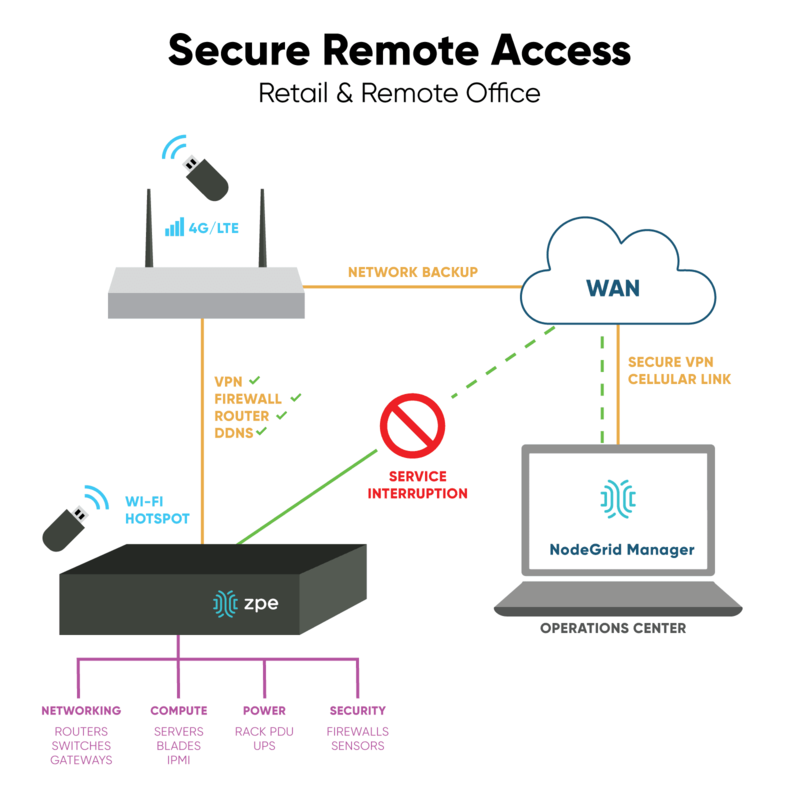 In fact, NodeGrid Serial Console offers more than just SSL client and server VPN capability to retail and remote office customers. Want to consolidate IT hardware in each store? Add backup capability? Add more IP addresses, Wi-Fi and networking capacity? Enterprise grade cellular modem – your choice of carrier, model, features and plans. Ideal for network failover and redundancy at globally distributed remote offices and retail stores. Gateway and routing (IP forwarding) capability – intelligent multiple routing table algorithm for physical network or logical network fail over detection. DHCP server – provides extra IPs for your remote site on regular or emergency basis – or replaces your current router altogether. Firewall – built-in and turns on with a checkbox. Power control and monitoring – get alerts of suboptimal IT device health before POS malfunctions occur. Repair hardware faults automatically. Preventive medicine is the best kind. Security – built-in selectable 1024-bit encrypted cryptographic protocols and selectable cypher suite levels: high, medium, low and custom. NodeGrid Serial Console supports X.509 SSH certificates, Local, AD/LDAP, RADIUS, TACACS+, Kerberos authentication, user-access lists per port, group/role-based authorization, granular authorization for port access, power access, appliance privilege, system configuration checksum, system event syslog and more. Docker and scripting apps – bulk up your stores’ customer services by deploying your own in-store DNS Server Docker app (customer-store interactive Wi-Fi), NFS Docker app for extra storage use (CCTV or product display playback), or any other new scripts or apps which increase in-store profitability, YOY. Wi-Fi hotspot ready – start beaming your own Wi-Fi signals. Just plug any USB Wi-Fi antenna into your NodeGrid unit. Perfect for the far corners of your retail empire. Fast remote hands troubleshooting of retail and remote office server, network, power and storage issues. Dedicated central office staff quickly triage and solve IT issues, greatly reducing the need for on-site IT staff at retail and remote office sites. 24×7 access to IT assets via your choice of cellular provider. ZPE doesn’t lock you into one or two pre-determined carriers. Choose any carrier regionally and globally based on availability, reception and cost. Seamless enterprise level security, networking continuity and access to your IT devices. Think NodeGrid Serial Console might be a good fit for your environment? Give us a call -or- Contact a ZPE Pre-Sales Engineering Representative for more information. Share the post "Maximizing Retail And Remote Office Uptime"